FOR: Fans of strong female characters. Fans of Meg Cabot. Anyone looking for a well-written summer read with a realistic romance and real-world, down-to-earth drama. Amy is fine living in the shadows of beautiful Lila and uber-cool Cassie, because at least she's somewhat beautiful and uber-cool by association. But when their dates stand them up for prom, and the girls take matters into their own hands--earning them a night in jail outfitted in satin, stilettos, and Spanx--Amy discovers even a prom spent in handcuffs might be better than the humiliating "rehabilitation techniques" now filling up her summer. Worse, with Lila and Cassie parentally banned, Amy feels like she has nothing--like she is nothing. Navigating unlikely alliances with her new coworker, two very different boys, and possibly even her parents, Amy struggles to decide if it's worth being a best friend when it makes you a public enemy. Bringing readers along on an often hilarious and heartwarming journey, Amy finds that maybe getting a life only happens once you think your life is over. I’ve been stoked about reviewing this book for a long time. It’s the first cover reveal I was part of, and the first advanced review copy (galley, technically) I’ve ever received. And ten pages in, I knew I would be writing a glowing review. Pretty Amy brings me back to my own high school days, reading The Princess Diaries and feeling like a no-name loser. Wondering if I’d ever become someone people remembered. Amy is that insecure part of every teen girl, always worrying if she’s pretty enough, popular enough, independent enough. Looking for any source of identity she can find. 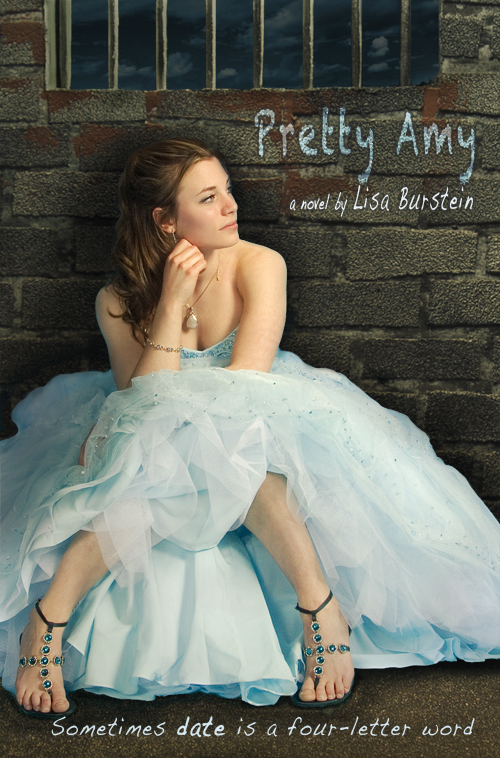 Amy finds her identity in beautiful Lila and badass Cassie, but when they’re all arrested on prom night and the consequences are much worse than detention, she realizes that she still doesn’t know who she is. That’s one of the things I loved about this book. Watching Amy find herself. From the beginning, you know she isn’t really happy. She’s the leftover friend. The burnout huddling with a cigarette, not because she really wants to, but because it makes her feel like she belongs. As a reader, I connected with her instantly. I wanted to hug her, to slap her, to tell her that she was making the wrong decisions. But even when she was her most bratty-teenage annoying, I never stopped rooting for her. Burstein gives us a real person. Not a Bella. Not a badass hero. Just a bumbling teenager struggling to decide who she is and who she wants to be, with the threat of prison and a ruined life hanging over her head. I adore fantasy, but sometimes it’s good to remember real people. How easily a few decisions can change everything. What it’s like being a normal girl with normal problems. Before I wax too sickly poetic, back to things I loved. The plot was tight and moved along at a snappy pace. Things were never easy for Amy, but never so hard as to be melodramatic either. You could imagine real people acting the way they do in this situation, even when they’re cold and cruel. As for the writing, I had little to complain of. YA isn’t known for good writing, but Burstein is one of those rare good ones. Her MFA shows through. It’s accessible, pretty in places, snarky and funny in others, and only occasionally too overwrought with metaphors. Amy’s personality shines through in the choice of every word. I lost a lot of sleep over this book—because I had to force myself to put it down. If it doesn’t make you say “Just one more page,” you can come tell me what a ninny I am. But give Amy a chance. Maybe she’ll teach you a few things.